There are a couple of locks above Nancy that seem to be the nemesis of those who would travel on this canal, but we thought that if we left at nine, we’d have a fair crack at getting through them both by sunset. This turned out to be good thinking because by the time we got to the second of the two there were some very furrowed brows and worried expressions on the lock repair crew, who had thus far managed to avoid the pressures being exerted for them to extractus digitus by at least half a dozen small boats drifting around below, two medium sized barges and a floating hotel. When an inanimate object becomes misaligned with another inanimate object, we’ve never actually seen the point in getting upset with the people trying to realign it nor for that matter with the object itself particularly when that object is a lock gate, so we spent a pleasant few hours chatting in the sun with a lovely couple from Germany before finally finding ourselves underway. Not long thereafter, noticing by chance that there was something terribly awry with our very own ship-board charging suddenly the point of getting (only very slightly) upset did become a little clearer. We have tucked all those nasty thoughts away for the time being though, packed up all our cares and woes, for we are in Nancy, where the streets are paved with gold, and nobody ever gets old. No, that’s another place, but it’s still beautiful and if the flowers in the gardens aren’t enough, you’ll find them on the buildings as well. I hope that they are fixed soon. Bill working on toilets, and the engine stop tomorrow. Going to Brittany around middle of month for ICC+CEVNI all being well. Prac is in a Bavaria 36 - that will be interesting! !! Boat is much cleaner. Now that we have been pulled astern (adjacent to where you were recently) then we can make a better fist of cleaning the stern. Tomorrow I will probably taking Phillipe to Sarrebourg to pick up another car. I hope to have time to drop into SFR and pick up a Webtrotter. I ordered the sim card from Avetra (?) yesterday. Wow wow wow. You sure do come across pretty special places. 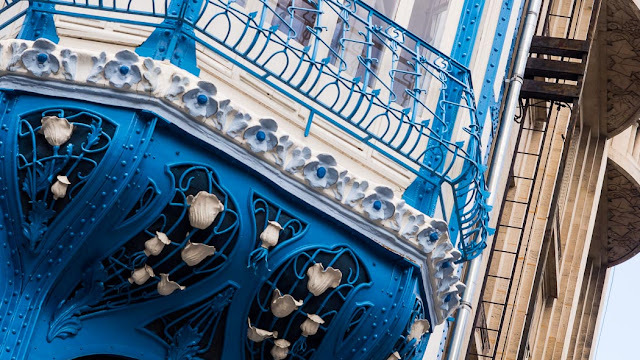 This art nouveau detail is just superlative.